Here is a pic of the Academic Allstate Swimmers from OA. 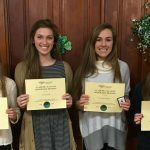 (left to right: Erica Geers, Anya Smith, Caroline Storms, and Mikaela Fangman) Congratulations girls! Erica Geers and Mikaela Fangman were awarded Academic All-State honors for the swim team. Anya Smith and Caroline Storms were also awarded Academic All-State Honorable Mentions. These athletes were selected for their outstanding accomplishments in the classroom as well as their contributions in the swimming pool. Congratulations girls! Girls Varsity Swimming · Feb 8 OA Girls’ Swim Team Sectionals! 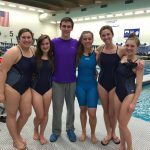 Girls Varsity Swimming · Feb 5 OA Girls Swim Team at the Preliminaries for Sectionals!